Ever since my clothesline broke last fall, I've been using our indoor clothes drying racks. (For new readers, we have a clothes dryer but prefer not to use it because it uses so much propane and electricity.) But clothes racks are expensive and/or hard to find second-hand, so I'm chronically short of drying space when it comes to doing laundry. 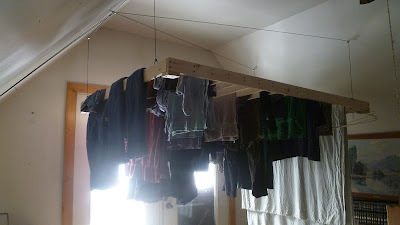 So my dear husband offered to build me a clothes drying rack, one that is attached to a pulley system from the roof of our upstairs. To explain a little something about our house, it's two stories and has a steep-pitched roof on the upstairs. Don's idea was to install a hanging clothes rack above head-level near the upstairs deck doors. 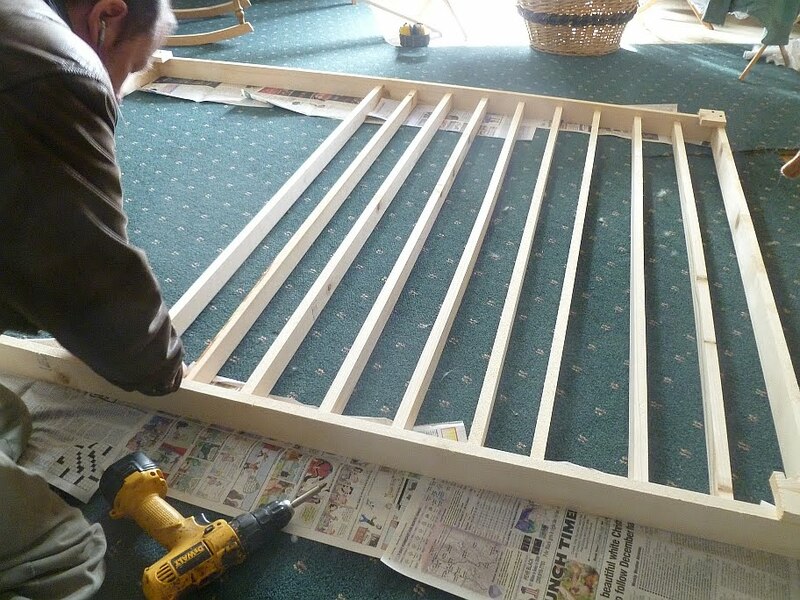 So he made a sturdy frame about five by seven feet. The cross-pieces are rounded on one side so as not to crease the clothes. 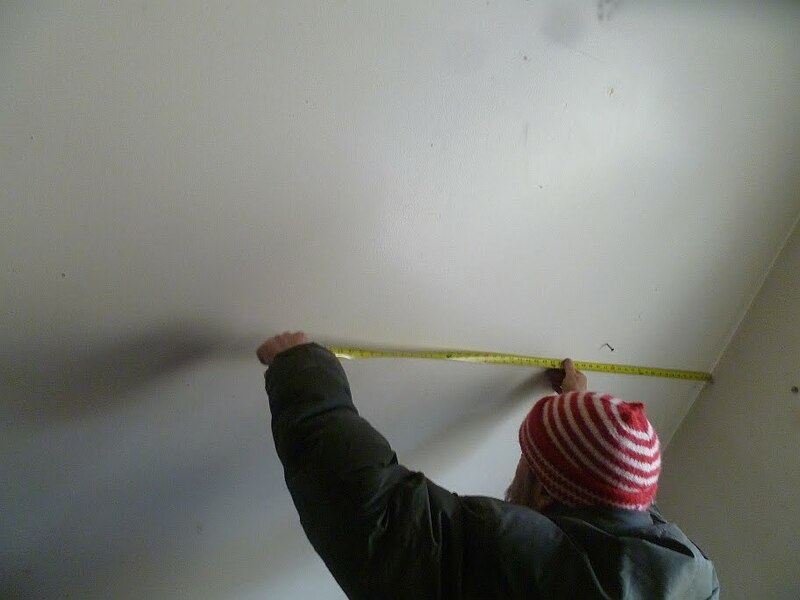 He had to measure how far down the sloped ceiling to put the hooks and pulleys. He used paracord because it's so strong. 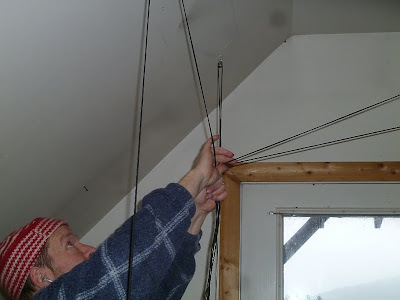 Here Don is hooking all the cord through the pulleys and drawing them through a single O-ring so the unit can be raised and lowered on an even keel. He made a sturdy tie-down anchored into the roof studs to hold the unit at whatever level I wish. And it works beautifully! Here it's holding a solid three loads of laundry. 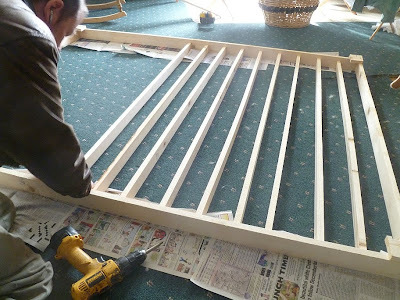 It can handle sheets (washing sheets is a perpetual problem in the winter because we don't have anyplace large enough to dry them except our stairs banister, which only holds one at a time) as well as extra-large towels. At the same time, too! Oooh, I just love being married to a woodworking man! Great wood working. These are the types of jobs I like. A little bit woodwork, a little bit thinking and planning and a little bit trying something new. I can hear the wheels turning in my brain already. I will not covet. I will not covet. I will not covet. Looks great, and what a blessing! Forget flowers and candy, I'd take useful any day! That is such a cool idea. My husband does woodworking/furniture for a living, but doesn't make stuff at home because he doesn't have a workshop or many tools to use here. Very nice Don! I'm thinking it's completely out of the way, it takes advantage of the heat that naturally rises to the ceiling, it adds moisture to the dry winter air...and if you sew up some special harnesses you can tell the girls if they get out of line, it's the rack for them! This looks similar to the one Enola has. Is it an adaptation of hers? 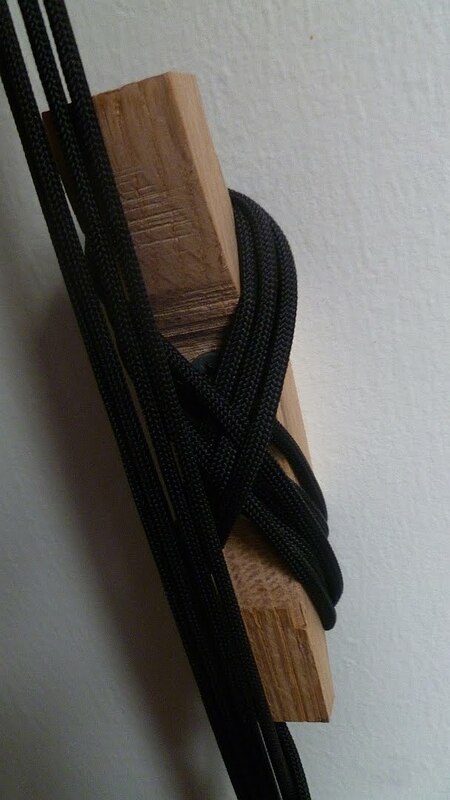 Paracord is wonderful stuff. Among its many virtues is that it doesn't stretch -- at all. Combine that with a trucker's knot, the one they use to tie down loads, and a knot known -- I think -- as a rolling hitch, and you can pull two things toward each other very tightly, and it NEVER loosens except when you want it to. 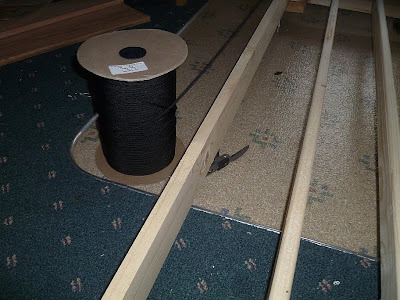 I have a perfectly good old bed, but the joint between the rail and post on one side is all chewed up. I could fix it in my wood shop except that that shop only exists only in my imagination. So, paracord, truckers knot, and rolling hitch keep that bed tightly together. Don, I'm very impressed at how you keep that thing level. I'd a been turning the air blue! Oh, I meant to add that about 100' of paracord lives in my jeep, and about, I don't know, 6 feet tightly coiled in my winter coat pocket. I have used it for all kinds of fixes and rescues like holding a pickup tailgate closed to tying a car door closed -- both belonged to OTHER people!! Once I even used it to tie up a sheet metal sign over the cart return corral at the super market that was flailing wildly in the wind before both ends came loose, and decapitated somebody. The bed, alas, is mine. Wow, that looks great! Your talented husband did a great job! THAT is awesome!! Great use of space and problem solving! Love it! 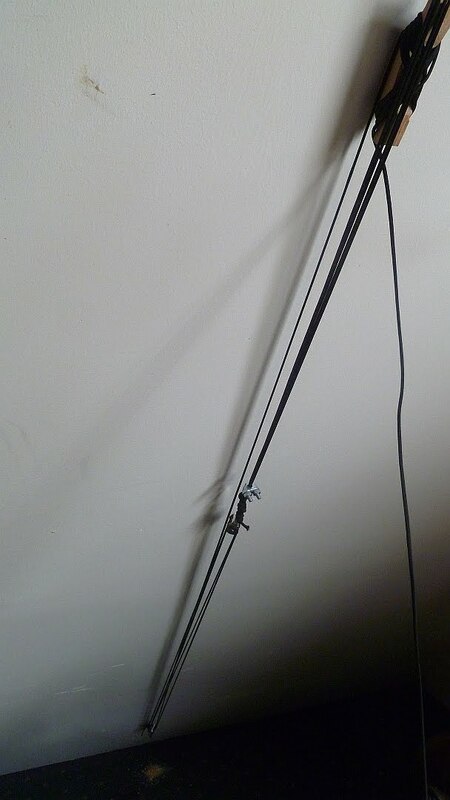 Anon 11:42, yes this hanging clothes rank was **greatly** inspired by Enola's. Let's hear it for our creative men! Oh. Wow. That is fantastic!!!! 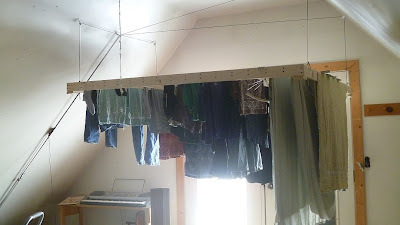 i love that it is up high where the heat goes - i hate drying clothes in the (unheated) basement - it's the coldest place in the house. love it, i would imagine a few loads of laundry are too heavy for my wife so i would add a ratchet wheel for raising and lowering the loads.